Apart from pointing out that this record is loosely conceived around ideas of the Middle East, it's pretty hard to describe. Post-punk synth rock? Ugh - I hate those kind of labels. All I know is this - Bolides Over Basra is just endlessly fascinating and inspiring. I reckon it's probably the record I listen to the most out of the ones I've chosen to speak about here. Mostly because it just makes me want to make music - and that, in and of itself, is reason enough to count it in my top favourite albums. It came out in 2000, which was the ultimate time for me to hear the work. Aaron and I had just conceived Liars and we'd spend our days bundled inside our Brooklyn loft making endless amounts of songs on four-track tapes. The process of how we made music then is similar to what attracts me to Bolides Over Basra. Basically 'musicianship' was the furthest thing from our minds. The most important thing was the idea of creation and making music for the limitless expression it enabled. We'd do things like put a brick on a Juno keyboard to generate a steady tone then record ourselves playing drums mic'd through guitar pedals. Then we'd run a microphone out the window and scream lyrics from the rooftop. Stuff like that is kind of hard to imagine us doing now but when I hear Bolides it makes me want to pull out the four-track and find a handy brick. Anyway, back to the album. 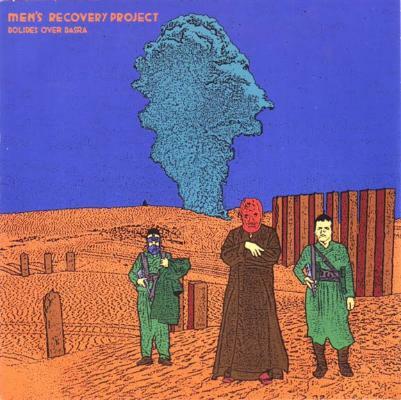 Y'know I'm sure some critique can be made of Men's Recovery Project's decision to dedicate a full album of songs to their vision of the Middle East. That maybe they were essentially epitomising an overused trope and contributing to stereotypes associated with that part of the world. I don't know. To me, it doesn't read that way. I always heard it as fascination with the mystery and history of the region rather than anything derogatory. It offered a really interesting backdrop for their music and gave the album this otherworldly air that was tied together so completely by the subject matter. Of course this all took on even more weight and relevance the year after the album's release when 9/11 happened. How could MRP have been so prescient with their album title? In no time flat we were all watching images of tracer fire in the night sky over Basra that could easily have been described as showers of bolides [meteors]. Whether you call it intuition or just plain dumb luck, for me this has always lent an extra level of significance to Bolides Over Basra.